If you want the tasty, rich gravy that you remember your grandmother made for turkey or chicken, instead of a packet of chemicals mixed with water, then here's an easy recipe for you! Following these directions ANYONE can cook a perfect turkey dinner for Thanksgiving, Christmas or any occasion! Click here to return to the "How to cook a turkey directions". Turkey or chicken broth - preferably the juices from a cooked turkey or chicken, but canned (or boxed) chicken or turkey broth from the grocery store will work, too. Most grocery stores now sell fat free organic versions! 1/2 teaspoon dry Rosemary, or 2 sprigs fresh. 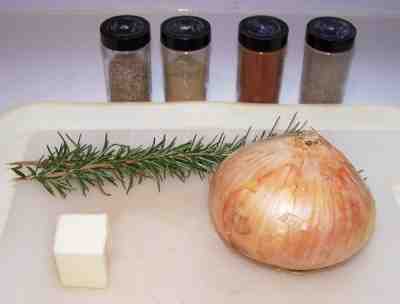 1 medium onion - diced - I do about 1/4 inch squares but anything from 1/2 inch slices or smaller is fine. Just drain all the liquids from the turkey into a large pot! 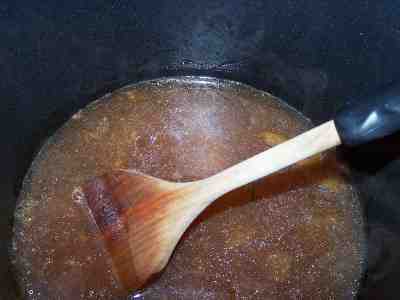 Next, ladle off the fat that will float to the top! At far left is gravy with fat floating on top. 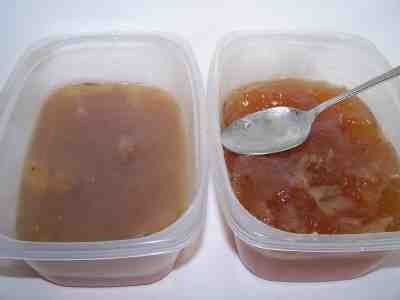 At right, gravy after spooning off the fat. 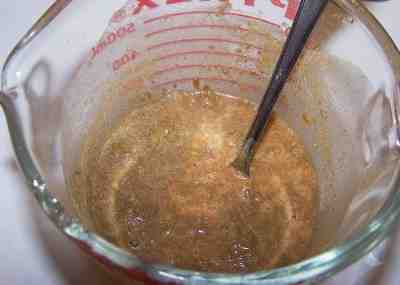 Mix 3 or 4 tablespoons of cornstarch with a half cup of water and 1 teaspoon of ground Thyme. Mix until there are no lumps. 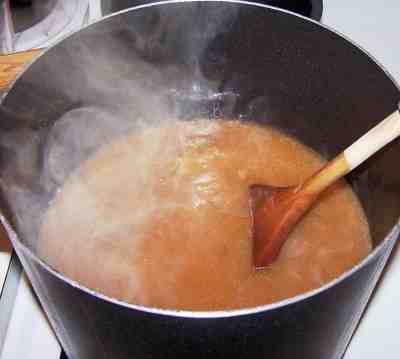 When the gravy is boiling (a rolling boil), pour in the seasoning, stirring continuously. After boiling for 1 minute, turn down the heat to very low. The gravy should have thickened! If you want it thicker, just repeat this step! Looking for simple apple pie directions ? How about a pumpkin pie ? And for even more detailed turkey instructions see Clemson University's page! Comments from a visitor on December 31, 2010: "Hi! I have been using your gravy recipe for a couple of years now and I just wanted to take a minute to thank you! Its easy to make, tastes great and has no preservatives or chemicals. A huge hit with my family (I always double the quantity because it goes fast) and its their favorite part of a holiday meal. Way to go!"